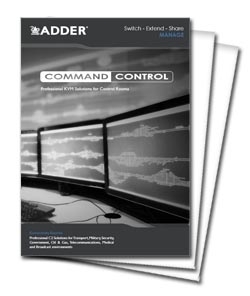 The AdderView Secure AVSD1004 KVM Switch enables a monitor, keyboard and mouse, and audio to be shared between high and low security systems, sometimes known as red and black networks, and is designed carefully to prevent information flowing between computers or to the outside world via emissions snooping. The AdderView Secure design prevents sensitive data from leaking between ports, sensitive data leaking to the outside world and sensitive data from being stored in the device. Furthermore, the switch actively combat a range of potential leakage "threats". The AVSD1004 is designed to enable four computers in a secure environment to be controlled from a single high resolution KVM console using dual link DVI or VGA (via optional DVI-I to VGA adaper). Dual link DVI interface operates at full DVI bandwidth up to 2560 x 1600 @ 60Hz to ensure higher end applications that require high resolution or exact video quality to run smoothly. DVI interfaces have the added security advantage that randomizing the low order video bit can make snooping much harder. AVSD1004 is also known as the AVSD1004-US and AVSD1004-USA.